Here is the text of that box in full. A couple of years ago, I took out a fixed term bond with you for one year. I was informed that this would provide a good interest rate, and instant access to my money in the case of an emergency. The term of the bond is over, and I have now been trying to access the money in the account for over 5 months. Santander seems to be completely incapable of providing me any access to this money whatsoever. I just want the money from my account, that's all. In detail. I visited Cambridge Sidney Street branch in early January, and ask "how much money is in my account?" - I'm told that only a financial advisor is able to access my account, and that none are in. I am directed to the Trinity Street branch. I visit the Trinity street branch, and the same issue occurs and I am directed to the St. Andrews Street branch. I visit the St. Andrews street branch and I am redirected to the Sidney street branch. I inform the person on the desk that I have already visited Sidney Street, and she instead redirects me to Trinity Street. I inform her that I have visited that branch too, and she looks confused, and then decided to book me an appointment with a financial advisor. These are only available on Tuesdays, and I work full time. I ask for a Saturday appointment, and one can be arranged for March. (Remember, this is an "instant access" account!) - so I book the March appointment. In March, I visit the Trinity Street branch, where the appointment is. He takes my name, and asks me to confirm that the details on his print-out are correct for me. I correct my address, which has changed recently, but the rest is fine. The man on the desk then informs me that the appointment has been cancelled. I am not given a reason. He informs me that they have phoned me to tell me, but could not get through. I pull out my mobile phone, and check it. I have not missed any calls in the last two months. I inform the man on the desk of this, and he insists that they phoned me, and claims that my phone number must be incorrect. I point out that I have just checked a printout with my phone number on it, and it is indeed correct. The man on my desk refuses to accept this and insists on taking my phone number to update his records. As it must be wrong. I am booked in for another appointment at the end of April. I visit St. Andrews Street in April. I am informed that the person who is supposed to be taking my appointment is ill, and that they have phoned me to cancel my appointment. I have no missed calls. Not wanting to again correct my phone number to the one that is currently in Santander's records, I apologise for not answering my phone and ask if I can book another appointment. This appointment is booked for May. At the beginning of May, success! I actually speak to a financial advisor, who can access all of my accounts. 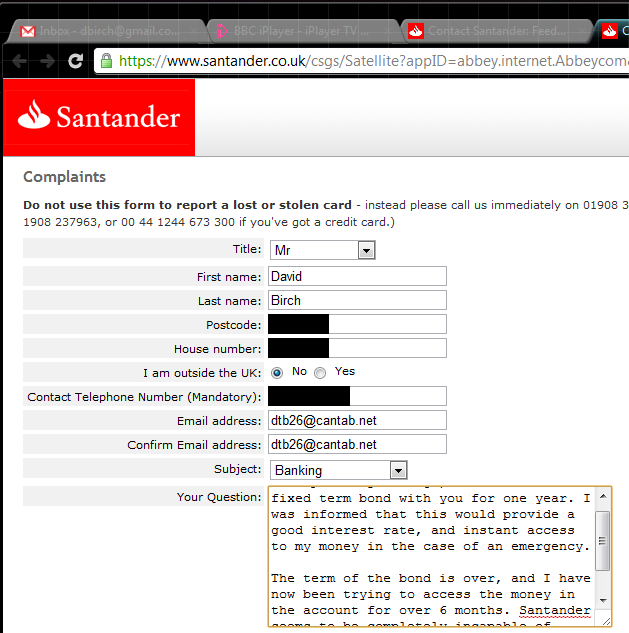 She checks my details and finds out that my address is wrong in the Santander system. Indeed, two addresses are on file for me, and both are wrong, despite me having corrected them in March. I appear to have three seperate accounts, a stock tracker ISA, a cash ISA and the fixed term bond. The last two of these are "instant access" - have been earning no interest for over six months and contain about �4700. I close the accounts and am told the only way to remove the money from these "instant access" accounts is by Santander mailing me a cheque. It is now the end of May. I have been mailed a check for the remaining contents of the cash ISA. This amount is �23.29. The contents of the Fixed Term Bond (about �4700) have not been sent to me. I am deeply concerned with the practices employed at your Cambridge branches, and especially concerned about what would have happened if I'd have needed this money in an emergency. The products I was using were sold on the pretence that it would be possible to get the money out quickly if such occurred. This is clearly false. I should not have to visit branches more than ten times, book three appointments and wait five months to get at my money, and this is only so far, no cheque has arrived! Additionally, the money in this account has not been earning any interest for the last 5 months, so my decision to save with you is evidently flawed. Please aid me in resolving this problem, before I am forced to report your practices to external authorities. Also, their Auto-Reply is in comic sans.